Apply your cleaners faster than ever before! 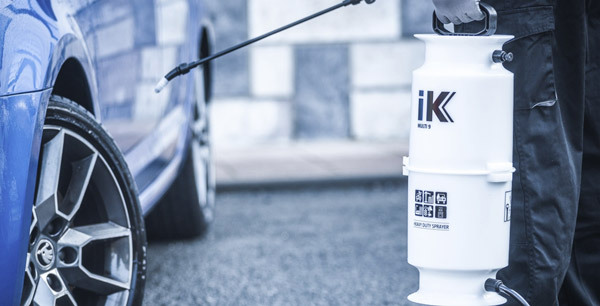 The IK Foam 9 Sprayer is the ideal tool for the professional detailer or the detailing enthusiast who is looking apply their detailing products as quickly and as effectively as possible! The large tank on the IK Foam 9 Sprayer not only stores a large quantity of product, but also contains a pressure system that will allow you to generate more pressure for spraying much more quickly! The specialized nozzles of the IK Foam 9 Sprayer will generate a thick layer of foam as you spray to make sure that your products are able to work as effectively as they can. You will even be able to use different nozzles to generate different types of foam! The entirety of the IK Foam 9 Sprayer is made using the highest quality chemical resistant technology to ensure that you are able to use any product without fear of corrosion! When you are tasked with applying an All-Purpose Cleaner or a Pre-Soak to an entire vehicle as quickly as possible, using a traditional sprayer to do it would take you potentially hours! Not to mention the severe amount of hand cramping you would have to endure just to apply all of that product. When you are working on a professional detailing job, that kind of time and fatigue can really eat into your profit margin. Even if you are working on your own car, spending that much time and having to ice your hand afterwards is still quite the annoyance! Luckily, the IK Foam 9 Sprayer will alleviate that annoyance and expedite your detailing process! Quickly coat exterior surfaces using the quick acting IK Foam 9 Sprayer! The large 1.3-gallon useful capacity of the IK Foam 9 Sprayer allows you to do quite a few applications before you even have to think about refilling it! This comes quite in handy when you are working away on multiple cars and need to get them done as quickly as possible. Having to step away from the car every 5 minutes to refill your bottle can really take you out of your groove and waste time unnecessarily! The large capacity of the IK Foam 9 Sprayer also means that you will have to stop and pump it much less frequently as well! The most important advantage to the IK Foam 9 Sprayer is its thick and abundant foam generation! If you weren’t already aware, a product that foams spends more time on the surface than a product that is just liquid. This is because the foam will cling and linger on the surface instead of just running right off due to gravity. So, using the IK Foam 9 Sprayer to turn your favorite APC or Pre-Soak into a foam will ensure that you are able to get the most out of your product every time! If you are a professional detailer or if you spend a lot of time working on cars that need a really deep cleaning, chances are you will be using some extremely harsh chemicals to get the job done. These chemicals tend to be so corrosive that they will eat away at traditional sprayers very quickly and leave you with no way to apply them. The IK Foam 9 Sprayer, on the other hand, was designed and constructed using high-quality FPM Viton® seals and washers and a Polypropylene and Polyethylene tank. All of these components are very resistant to the acids and solvents that are typically found in strong cleaners. You will never have to worry about the IK Foam 9 Sprayer being bested by your cleaner! Pinnacle Advanced Wheel Cleaner Concentrate 128 oz.